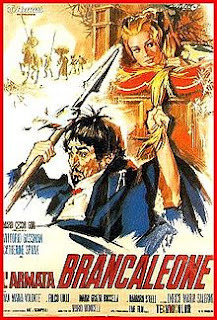 In the specific sphere of comedy, without contaminations from other genres, the highest level reached in the search for a type of comedy linked to remote periods is to be found in the diptych directed by Mario Monicelli: L'ARMATA BRANCALEONE (BRANCALEONE'S ARMY: 1966) and BRANCALEONE ALLE CROCIATE (BRANCALEONE IN THE CRUSADES: 1969). In a purely imaginary Middle Ages, a tattered and pompous knight, Brancaleone da Norcia, puts together an army as tattered and beggarly as he and marches off, engaging barbarians and running into adventures of various kinds, towards a town in Apulia of which he is to become the feudal lord. Age and Scarpelli, co-authors of the script with the director, have firmly established a true historical framework within which to interweave parodistic variations of every kind, drawing upon the grand tradition of popular legends, with allusions to famous films and novels and the original creation of a long series of merrily eccentric human types: for example, the Teofilatto of Gian Maria Volonte and the Zenone the Saint of Enrico Maria Salerno of the Abacucco of Carlo Pisacane (Capannell, the little old man in I SOLITI IGNOTI). For once, the second film was not inferior to the first, indeed the more specifically historical setting of the Crusades made it possible to concentrate the action around a specific nucleus and to use new actors in comically delineated roles: Luigi Proietti, Paolo Villaggio, Lino Toffolo, Gianrico Tedeschi. In the two films, Gassman is given a perfect vehicle, because all his past and present as a famous tragic actor can be summed up in a character who takes himself seriously, who declaims, preaches, poses as a hero, a great condottiere; and Gassman, precisely, can see such a figure in its true light, resorting to the acting techniques of the dramatic actor to immediately transform them into laughs and display a ferocious sarcasm.